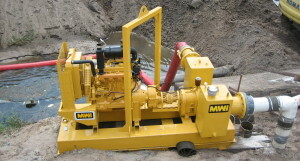 MWI’s construction dewatering pumps are used in a crucial part of the construction process. These dewatering pumps help to remove the groundwater at a construction site before a building’s foundation is placed or finalized. It is necessary to pump out groundwater from trenches, excavations, and places with inadequate slope to ensure a safe and secure workplace and environment, and our construction dewatering pumps are designed for just that. Builders typically use construction dewatering pumps to remove water from these areas, but they often find themselves unprepared or not entirely knowledgeable about how to discharge water properly. This can cause erosion and other problems. At MWI, we can set up your construction dewatering pump and can educate, train, and provide assistance if needed. We use submersible pumps, trash pumps, wellpoint systems, and other products to drain the designated area quickly and efficiently. We also help to ensure that best management practices are followed whenever water is being pumped into lakes, wetlands, or directly into storm sewer inlets. Contact us today to learn more about our construction dewatering pumps and how MWI Pumps can help with water management at your construction site.